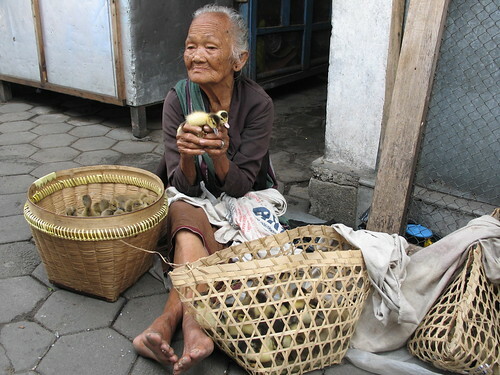 A women sells live ducklings in a ‘wet market’ in Indonesia (photo credit: ILRI/Chris Jost). A new study reveals conditions linked to the emergence and spread of deadly bird flu and maps the areas of Asia at greatest risk of the spread of the new virus strain. A dangerous strain of avian influenza, H7N9, that’s causing severe illness and deaths in China may be inhabiting a small fraction of its potential range and appears at risk of spreading to other suitable areas of India, Bangladesh, Vietnam, Indonesia and the Philippines, according to a new study published today in the journal Nature Communications. Researchers from the Université Libre de Bruxelles (ULB), the International Livestock Research Institute (ILRI), Oxford University, and the Chinese Center of Disease Control and Prevention analyzed new data showing the distribution and density of live poultry markets in China and of poultry production overall in the country. They found that the emergence and spread of the disease up until now is mainly linked to areas that have a high concentration of markets catering to a consumer preference for live birds and does not appear related to China’s growing number of intensive commercial poultry operations. They have pinpointed areas elsewhere in Asia with similar conditions (places with a high density of live bird markets) that could allow H7N9—which has infected 429 people thus far and killed at least 100—to significantly expand its range. Places at risk include urban areas in China where the disease has not yet occurred, along with large swaths of the Bengal regions of Bangladesh and India, the Mekong and Red River deltas in Vietnam, and isolated parts of Indonesia and the Philippines. ‘We’re not saying these are areas where we expect to see infections emerge, but the concentration of bird markets makes them very suitable for infection should the virus be introduced there, and that knowledge could help guide efforts to limit transmission’, said Marius Gilbert, an expert in the epidemiology of livestock diseases at ULB and the paper’s lead author. Gilbert and his colleges developed a ‘risk map’ for H7N9 in part to help anticipate where human infections—so far caused mainly by contact with birds and not through ‘human to human’ transmission—might occur next. Unlike H5N1, the other virulent form of avian influenza to emerge in recent years, H7N9 produces little signs of illness in birds, which means it could move stealthily into poultry populations long before people get sick. The obvious use for such maps in the immediate future is to help target surveillance to areas most at risk, which could provide advance warning should the virus spread and allow authorities to move quickly to contain it, said Tim Robinson, a scientist with ILRI’s Livestock Systems and Environment Program and a co-author of the study. The researchers found that the key factors facilitating the emergence and spread of H7N9 are dense clusters of live poultry markets, which aggregate birds from large geographical areas, located near or just outside densely populated urban areas. The existence of ‘wetland-related’ agriculture near the markets, such as farms that raise ducks in flooded rice fields, appeared to be a contributing factor linked to the initial emergence of the virus. But overall, the scientists did not find a link between the emergence of H7N9 and ‘intensive’ poultry operations proliferating in China that raise a larger number of birds. In fact, the study notes that H7N9 has thus far been absent from live poultry markets in Northeastern China, a region that is home to many of the country’s commercial-scale poultry operations. The study notes that there is evidence that certain factors within live poultry markets, such as the amount of time the birds are there, the rigor of sanitation measures, and ‘rest days’, that can influence the spread of the disease, suggesting potential options for reducing risks of further transmission of H7N9. But researchers also point out that in China, despite ‘remarkably strict control efforts’, the virus has continued to slowly expand to new areas—evidence that ‘H7N9 is difficult to contain along poultry market chains and may spread beyond the distribution indicated by the human cases’. New maps of distributions of global livestock were produced by ILRI in May 2014 in PLoS ONE by Tim Robinson et al. Many of the insights in the report have been possible because of a new set maps that are allowing researchers to observe, down to the square kilometre, the global distribution and density of the billions of poultry, cattle, pigs, goats and other livestock that exist in the world today. Robinson said that mapping livestock populations is particularly important in the developing world—and especially in Asia—where soaring demand for animal-source foods is driving production growth in what has been termed a ‘livestock revolution’. For example, in the avian influenza study, the maps helped researchers rule out intensive poultry operations in Northeastern China as a source of H7N9 and thus possibly avert a costly and likely futile intervention aimed at indiscriminately culling poultry. Read the research paper: Predicting the risk of avian influenza A H7N9 infection in live-poultry markets across Asia, Nature Communications 5, by Marius Gilbert (Université Libre de Bruxelles), Nick Golding (University of Oxford), Hongjie Yu (Chinese Center for Disease Control and Prevention), Tim Robinson (ILRI) and others, doi:10.1038/ncomms5116, 17 June 2014. Read a report on the new mapping paper: New maps for navigating a sea of changes in livestock production, 30 May 2014. Tags: Chinese Center of Disease Control and Prevention, Environmental Research Group Oxford, FAO, H7N9, IIASA, Livestock-Geo-Wiki, Marius Gilbert, Nature Communications, Tim Robinson, Université Libre de Bruxelles, University of Oxford. Bookmark the permalink.